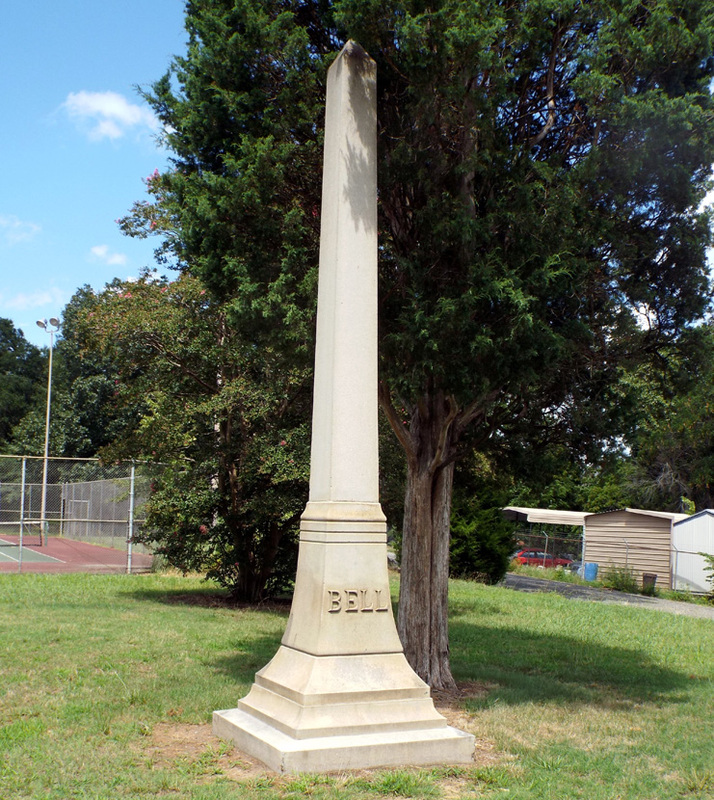 The Captain Bell obelisk stands 25 to 30 feet tall. The lower of two base pieces is a double bevel style that narrows up to the upper base (plinth) which holds the inscriptions. The plinth has a single bevel at the top with several incision lines beneath that provide definition before transitioning to the obelisk proper. Rear: ERECTED A.D. 1923 / BY THE LOYAL / STUDENTS OF / CAPT. W.T. R. BELL / WHO WAS FOUNDER / AND PRINCIPAL OF / MILITARY HIGH / SCHOOLS CONDUCTED / AT KINGS MOUNTAIN, / SHELBY AND / RUTHERFORDTON, N.C. 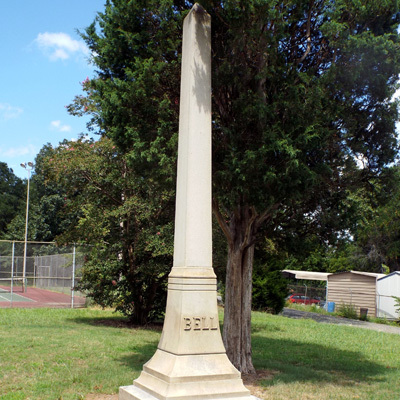 Although a Virginia native who served as an officer in the Army of Northern Virginia, Bell moved to North Carolina shortly after the Civil War ended. He became well known across the state as an educator, newspaper man, member of the General Assembly and speaker at reunions of Confederate Veterans. Although past the age limit he was still elected as Captain of Company B, 2nd NC Regiment, a volunteer company formed during the Spanish American War. As an educator he served from one end of the state to the other, first in Carteret County, later as Principal of Kings Mountain High School and founded the military institute located at different times in Kings Mountain, Shelby and Rutherfordton. As a newspaper man he worked at papers in Kinston, Winston Salem and as editor of the Rutherford Sun. The obelisk is located on an empty lot in the 200 block of W. Marion Street (US Business 74) where the military institute once stood. It is on the right hand side of the street when traveling west from downtown Shelby. The obelisk is very close to a large cedar tree with the tip of the obelisk obscured by branches. Behind the empty lot is a set of tennis courts.